Next up in my series of BTTF reviews is Back to the Future Part II, the film that wowed everyone with a glimpse at what the future could possibly look like, and although it is clearly nothing like it was envisioned in 1989 it is still very interesting to see the ‘future that could have been’ come to life on screen. Back to the Future Part II did what all sequels should do, it was larger in scale, it took bigger risks and it took the series to a whole new dimension by really focusing on the use of time travel. Now although it was bigger and the timelines got a whole lot more complex, topping the first film was nearly impossible but they tried their hardest and it payed off, making this film also an instant classic. Like its predecessor, this was also an endlessly entertaining film, still capturing the same humour that the first film did so well it manages to make you laugh consistently throughout. The characters of Doc and Marty again have great comedic timing and their chemistry is like no other film and it adds to the realism of these characters relationship. Whilst also maintaining that comedic aspect, the film also does spend quite a bit of time getting pretty serious and developing the plot for later in the film and for Part 3. This film had the daunting task of having to top the first one, and how do you do that? Rather than going 30 years in the past they decided to go 30 years into the future. But why stop there? lets go 30 years into the future then 30 years into the past in another timeline and then 30 years into the past again just to mess with people. Although there was a lot of jumping between timelines in this film it managed to hold itself together very well without seeming like it was moving too fast. As expected, with all of these time jumps, the timeline of events is going to get a little more confusing, but the film i thought did a pretty great job at keeping audiences informed as to what was going on. There were a few exposition scenes that were a little too ‘heavy’ on information that could have been spread out a little. Having just watched it for like the 10th time, it all makes sense to me but for a first time watcher it may take another viewing to fully grasp the timeline changes. A very minor thing in a film that still does time travel better than 98% of time travel films out there. 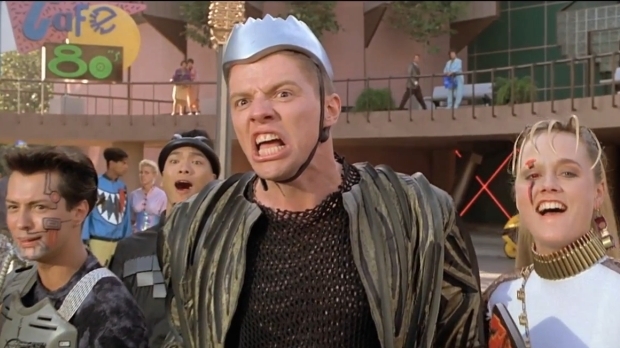 One of the things that this film is remembered for is its visualisation of the future. 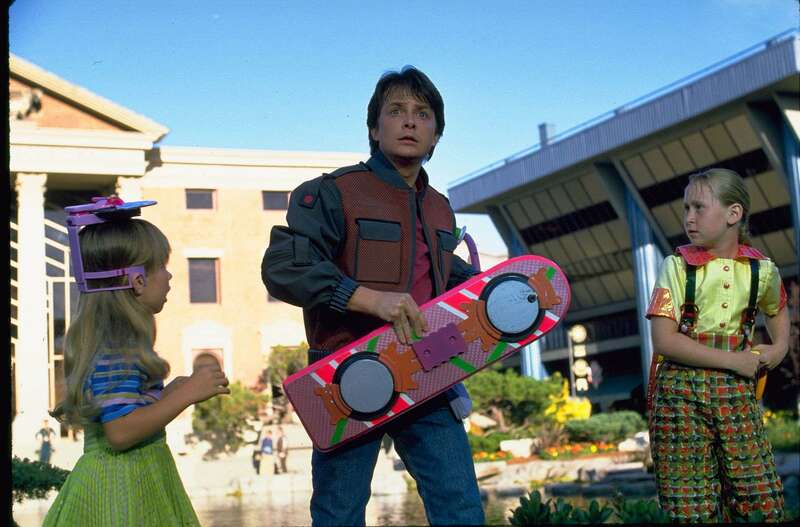 Seeing all of these technological advancements in terms of cars, and clothes, and shoes, and hover-boards was incredibly mind-blowing for me when i watched it so you could imagine how it must have been for an audience that was even further away from that possible reality. It was a very interesting contrast with other more dirty dystopian futures you see in most sci-fi films, the cleaner, brighter look made it so much more memorable. Like i said, they are the scenes everyone remembers, the hover-board chase scene is an iconic action sequence that will never be forgotten, the sequence in Marty’s future house was amazing seeing all of the small but significant advances in technology that people would only dream of. Many people often forget that the film also does represent the future in a very dystopian environment, and i thought in its own way, that was a very interesting juxtaposition to put in this film. Although it wasn’t as fun and lively as seeing the cleaner future it was definitely interesting to see how greed and a money driven future would look like. Looking back on it now, i would say that the Dystopian representation of the future isn’t any more far off than the Cleaner, more technologically advanced one, just saying. 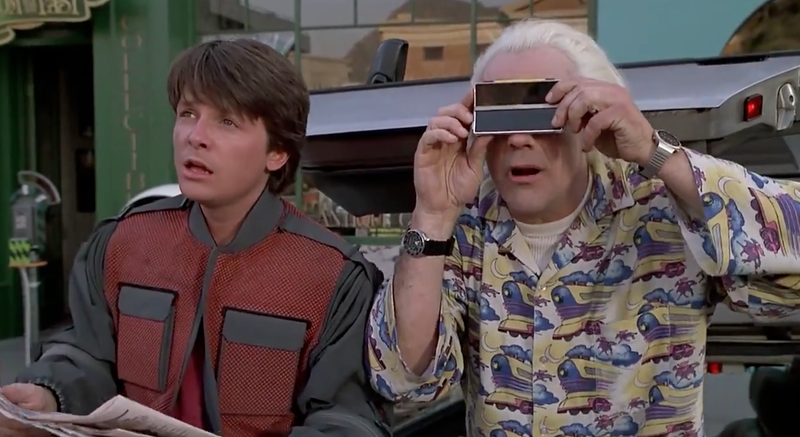 But one of the most impressive sequences for me was when Marty and Doc travel back to 1955, the setting of the first film, and have to go around this time period whilst avoiding their other selfs from the first film. This is what really wowed me in terms of the incredible film-making and visual effects that were used in order to make it look like they had actually travelled into the setting of the first film without compromising what the first film set up. The shots were placed perfectly and the use of footage from the first film in combination of recreations of scenes from the first film from different angles was incredible, and for a film released in 1989 it was amazing to see. It also has what i think was the most exciting and fun ending sequence of the series that had me laughing, and in suspense the entire time. It closes off the story of this film perfectly and sets up the next film in a similar way to what the first film did. It may even be one of my favourite movie endings ever, i get goosebumps every time i watch it. And that is also due to the return of Alan Silvestri’s incredible score and BTTF theme that gets me every time. Again, the attention to detail was incredible, with fantastic call-backs to the first film and the little details that connect the alternate timelines timelines together, and also some foreshadowing for what is to come in Part 3, Robert Zemeckis’ love for this world and these characters is on show. In the end, this film goes bigger, it goes to more places and it retains everything you love about the first film. It does lose some of that magic that you feel when watching the first film but it is still a masterpiece and a classic that even helped to elevate how good the first film was upon return viewings.